Garden of Aaron: Energizer Flowers in the October Garden of Aaron - Balloon Flower, Rozanne Geranium, October Skies Aster, Chaste Tree and more! Energizer Flowers in the October Garden of Aaron - Balloon Flower, Rozanne Geranium, October Skies Aster, Chaste Tree and more! I'm probably revealing my age here, but do you remember the Energizer battery commercials from years past with a battery-powered bunny drummer that kept going and going and going? That's just the sort of plant I admire in the garden, one that flowers for months and months without much (or any) external intervention. I actually went away for a few weeks in September and left my garden to its own devices. We had a warm September here in Tennessee -- meaning plenty of days with temps in the 80s and practically no rain whatsoever (0.25 inches for the whole month). 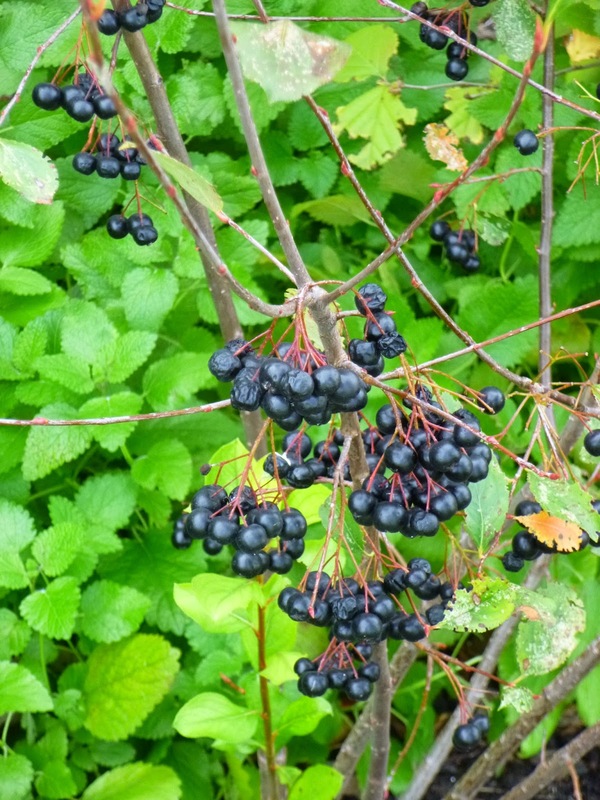 Bunches of black berries on the Aronia melanocarpa, Black Chokeberry. In prior years, these had some nice fall color. More recently, they seem to get defoliated (perhaps by lacebugs) every year, which doesn't seem to damage the plant much, but certainly eliminates any autumn color. Autumn Fern (a.k.a. 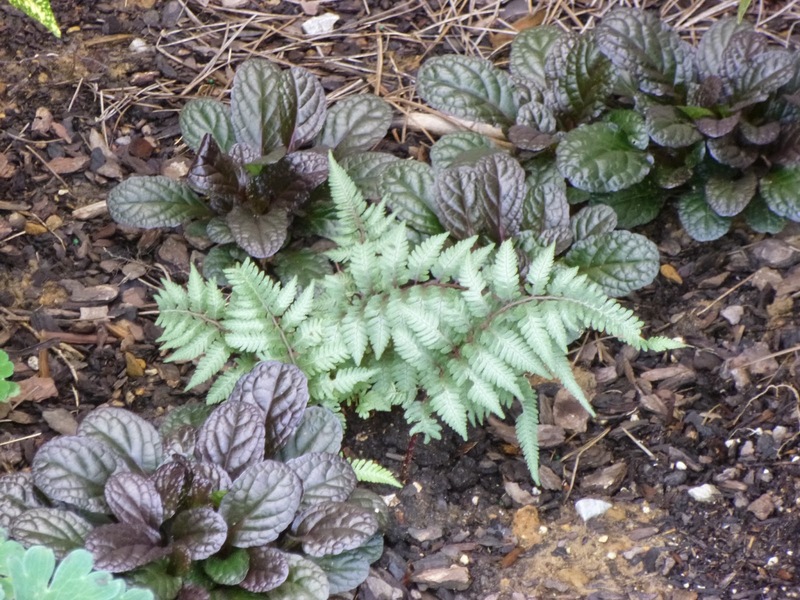 Japanese Shield Fern), Dryopteris erythrosora, I installed two of these in April in a partial shade setting. They seemed to struggle at first, but have since settled in nicely. Yep, it turns out there are ferns such as this that are remarkably drought tolerant once established. 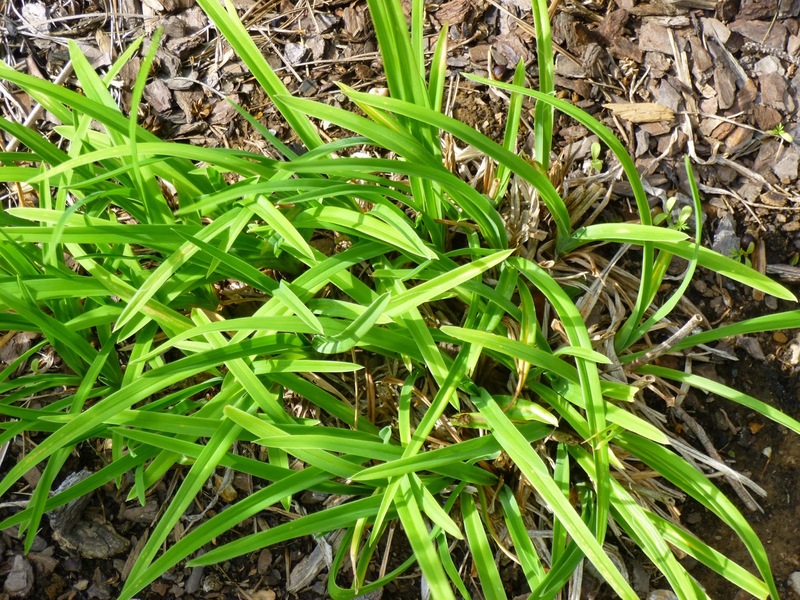 In fact, UGA recommends it as a groundcover for Georgia, which tells you it can take the heat (though it's also cold hardy to USDA zone 5). 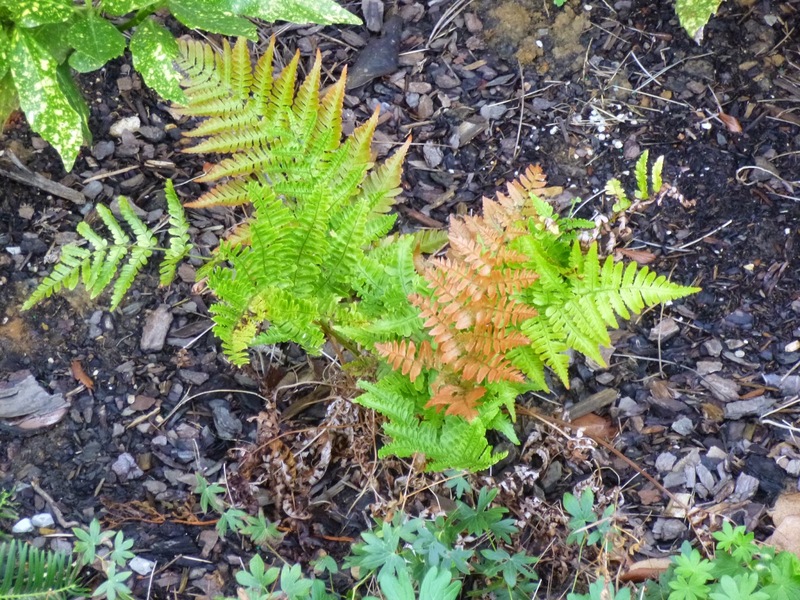 No flowers of course, but the new fronds have a beautiful copper color. 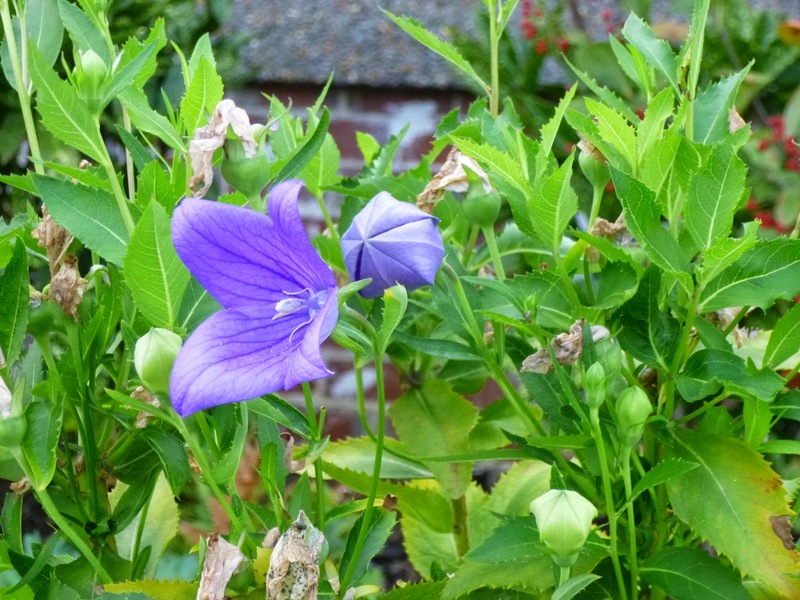 This is Platycodon grandiflora, the Balloon Flower. It had a nice long flowering period in the early summer, after which it formed seeds. Last year, I let the seeds mature and fall to the ground, which resulted in some self-sowing. This year, I trimmed back the plant by about one-third, which prompted it to rebloom vigorously. 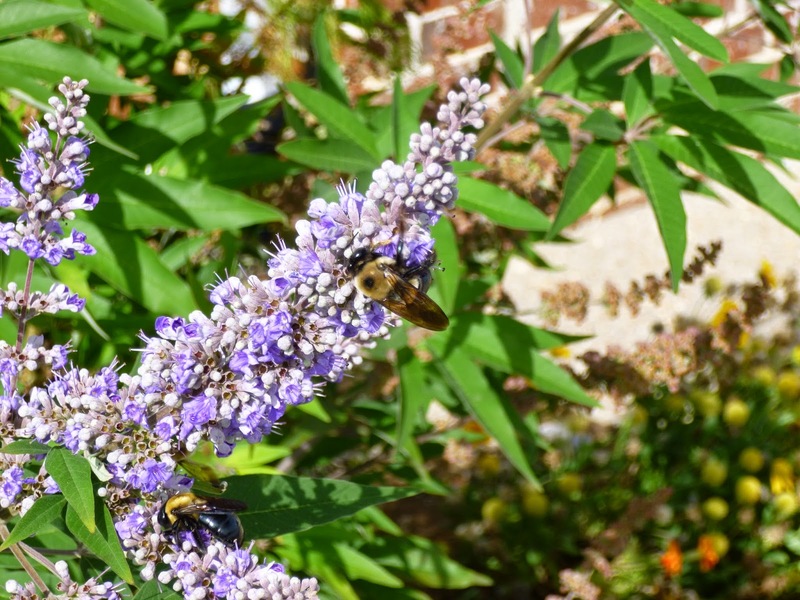 I've also noticed some bees visiting the flowers this year, which is nice. Baptisia australis, Blue False Indigo, this has pretty flowers in the spring, but it certainly doesn't fall into the Energizer flower category (the flowers only last a couple of weeks at most), But it's a trouble-free tough native perennial with lovely foliage that stays attractive all year. It is also apparently a host plant for the Clouded Sulphur butterfly, which I have seen in my garden this year for the first time. I just planted some new Baptisias from Prairie Nursery, so hopefully I'll have more Baptisia foliage next year upon which the Clouded Sulphurs can dine. I planted three small Spicy Globe basil plants in the spring. I hae to say this was not necessarily my favorite basil from a taste perspective. But they formed nice bushy plants (perhaps 8 inches high by 12 inches wide) that were covered with flowers for months and months. As you may be able to see in the left middle section of the photo, the flowers do a great job of attracting bees. 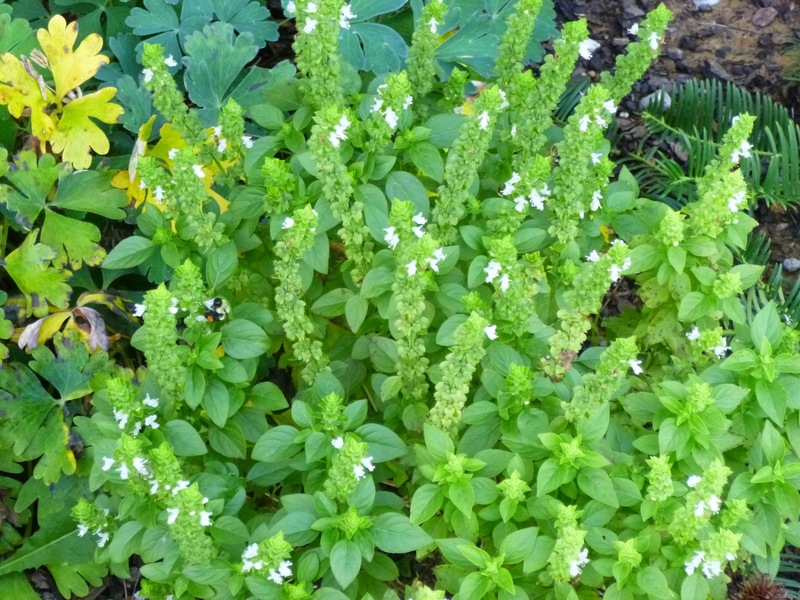 So if you're looking to attract pollinators to your garden, a few basil plants could work wonders. 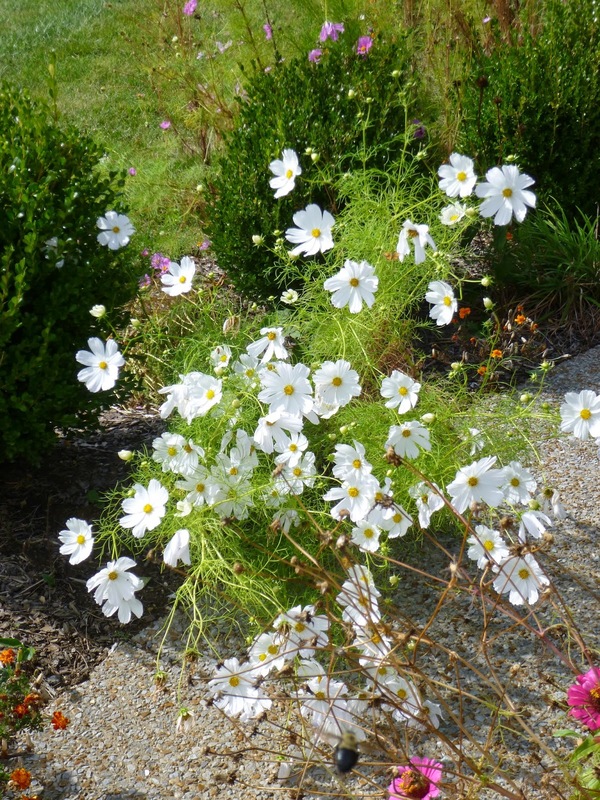 And unlike some herbs, they seem to grow perfectly well (at least in Tennessee) in partial shade. Since these got so much attention from pollinators and since I never cut them back, I'm very curious to see whether they will self sow next year. 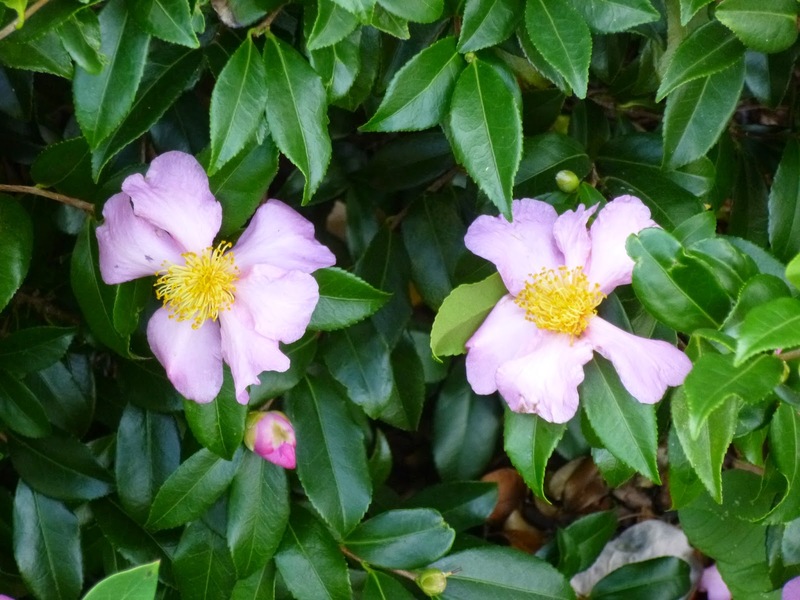 The Camellia sasanqua by the front porch has started blooming. You can't see it here, but the flowers attract a steady stream of honeybee visitors. 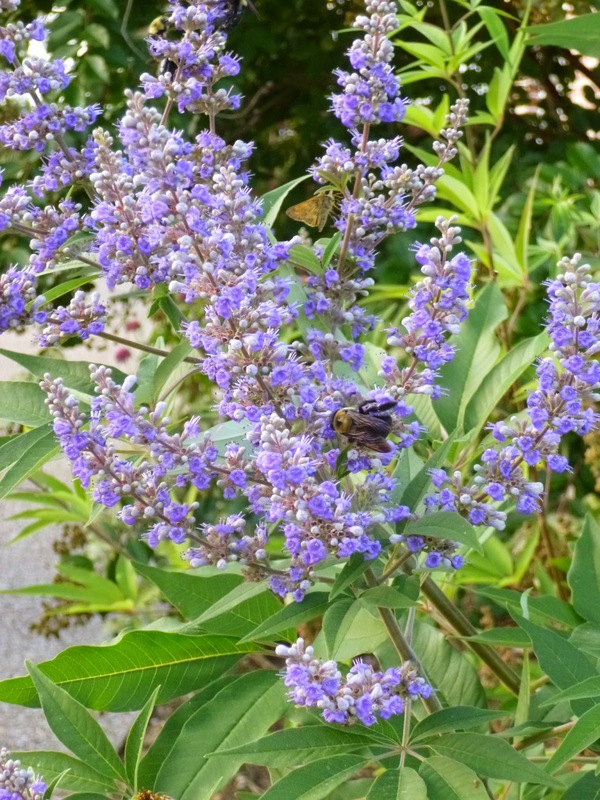 Even though I did not do any deadheading or pruning, the young Vitex agnus-castus (Chaste Tree) began reblooming in early September and was still going strong in early October. These flower spikes almost always have large bees hanging on them from dawn to dusk. They also attract some butterflies, as you can see from the small tawny skipper butterfly in the upper section of this photo. Practically all the cosmos have fallen over, but they usually are tough enough to keep blooming even while lying prone on the ground. And as you can see here, the (slightly out-of-focus) small bees will keep visiting regardless. 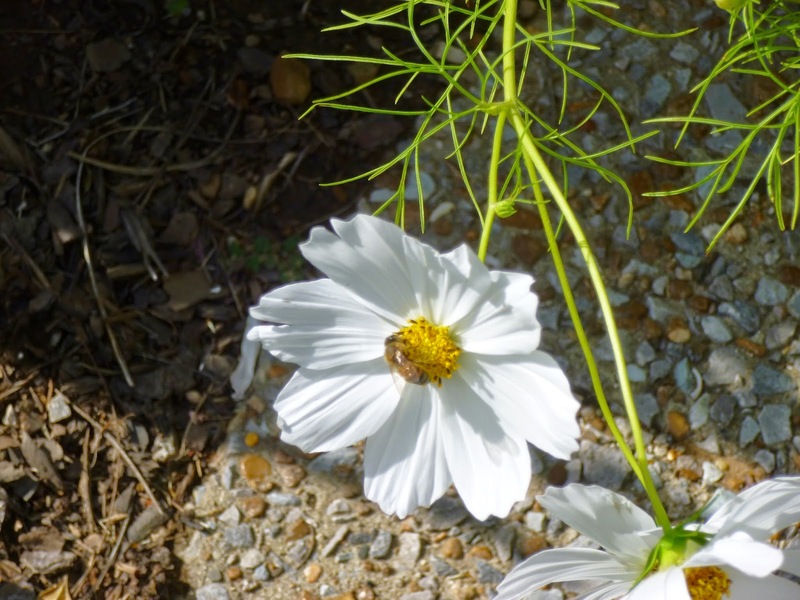 You may not be able to tell from this photo, but this (self-sown) cosmos plant has actually fallen across the path, but it is still blooming its heart out. No deadheading required for weeks and weeks (sometimes months and months) of blooms! I'm not a huge fan of daylilies, but I do have some in my garden that I inherited and more that I added before I decided I didn't like them much. One thing I truly dislike is staring at the dead, dying and damaged daylily foliage after the plants flower. So after doing some research online, I read it's possible to cut the daylilies to the ground and have them resprout fresh foliage (aquilegia will do the same). So I gave it a try and - voila! - it worked! 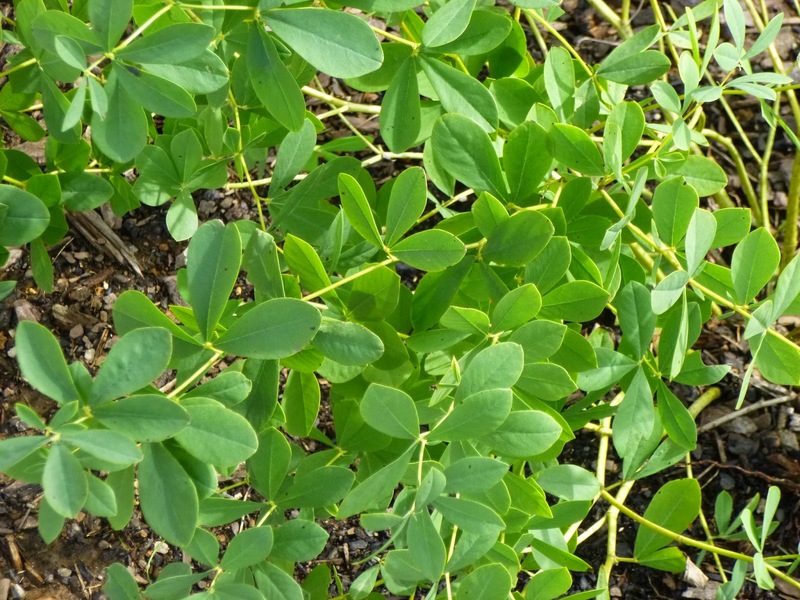 This clean foliage is much nicer to look at from late summer into autumn. 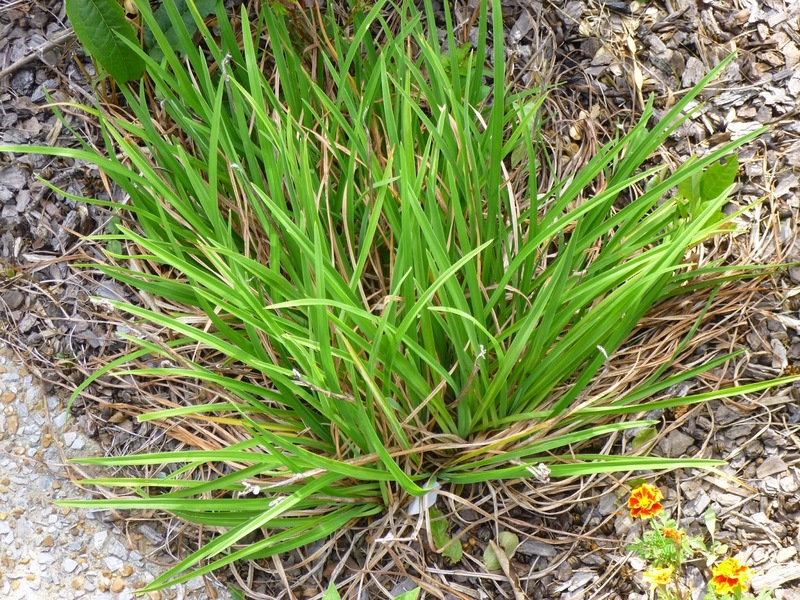 Another clump of daylilies that was cut back to the ground in mid-summer and has since resprouted vigorously with clean light green foliage. 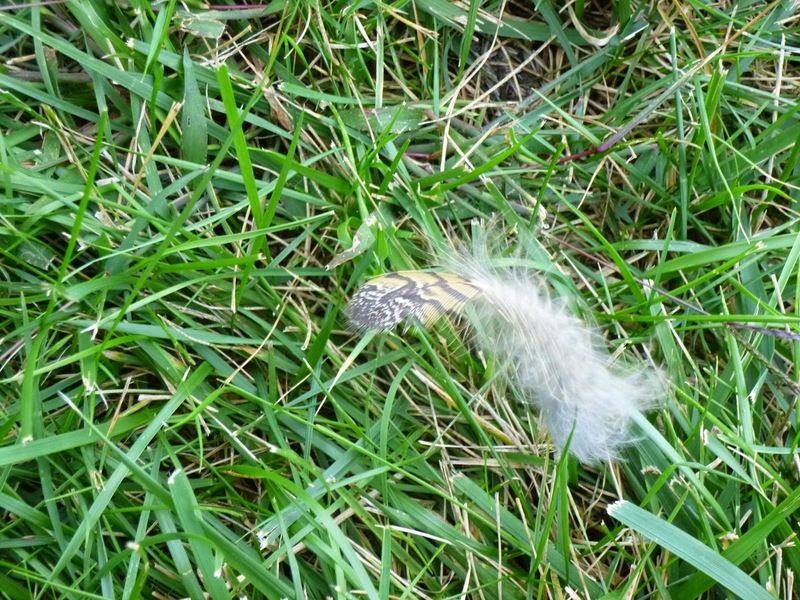 A feather found in the grass. Perhaps from a hawk? 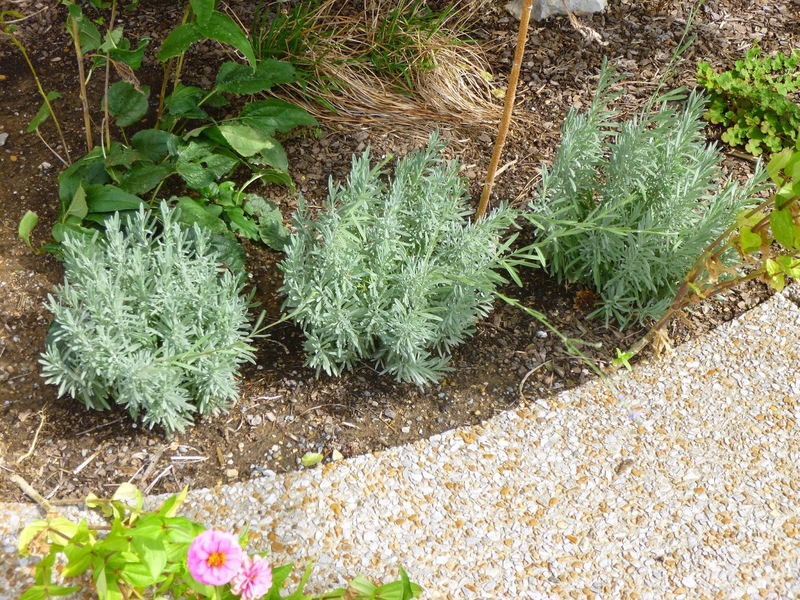 My three Hidcote lavender plants (Lavandula angustifolia, also called Lavandula officinalis) have all grown nicely this year, although they haven't flowered much. I fear I may have cited them in too much shade, or perhaps they are just getting settled. The big challenge with growing in Lavender in Tennessee (as I understand it) is not so much the cold - these are after all supposed to be hardy to zone 5. No, the real challenge is our heavy clay soil and winter rains. Lavender apparently cannot tolerate wet winter soils. That said, Hidcote is supposed to be one of the tougher lavenders, so I'll hope these guys can defy the odds and survive until springtime. 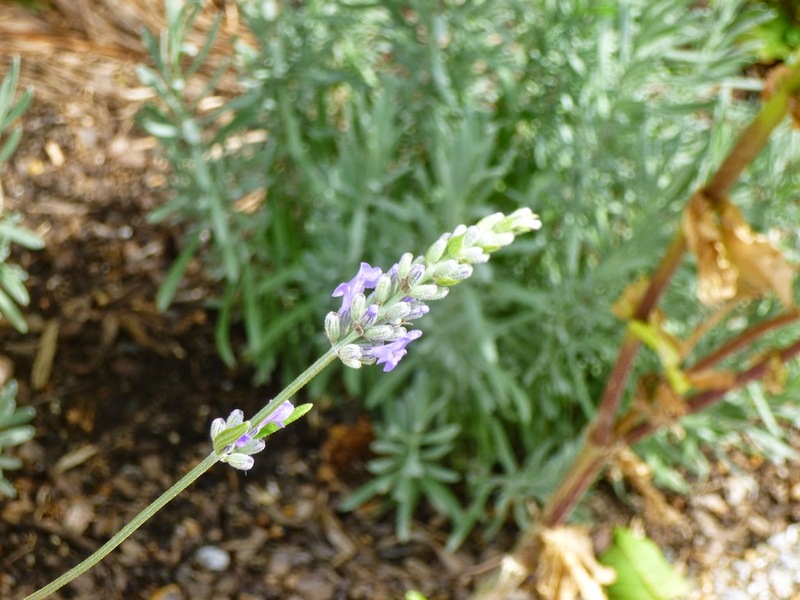 At first, I thought my lavender plants would not flower at all this year, but sometime in September they did produce a few tall flower spikes. Since this is my first year growing lavender, I'm not sure when I'm supposed to harvest it for dried flowers / potpourri. One of my favorite plants just keeps on giving. Lonicera sempervirens, the native Coral Honeysuckle, produces non-stop orange-red hummingbird-attracting flowers from very early spring to autumn. The flower production has slowed dramatically now, but all those hummingbird (and butterfly) visits have clearly produced results, as the plant is now covered in berries at various stages of ripening. 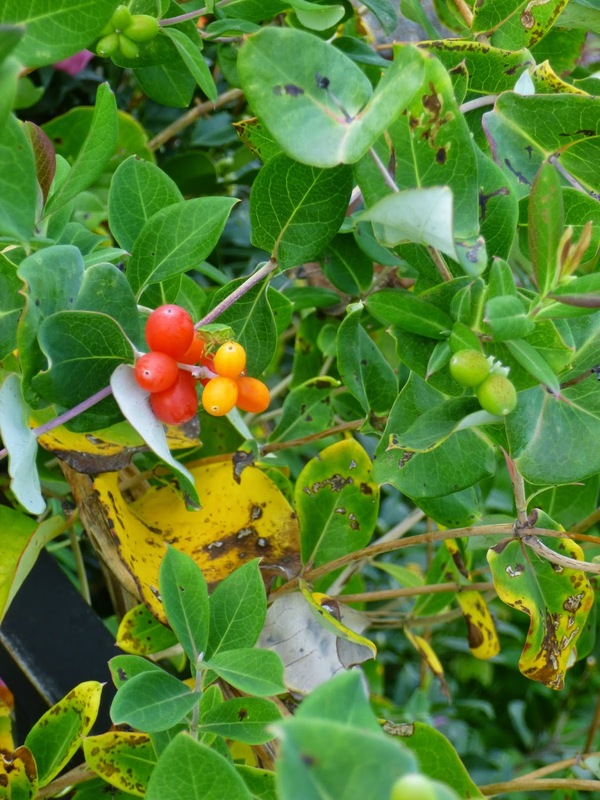 This photo shows all three stages of berries ripening from green to light orange to bright orange-red. 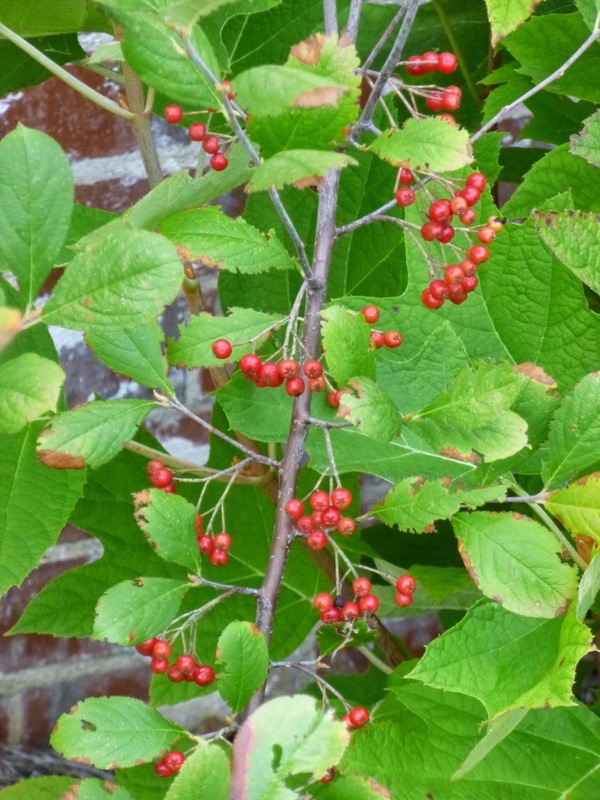 I haven't noticed any birds feeding on the berries yet, but American Beauties says that bluebirds, waxwings and many other birds will eat the fruit. You can see where October Skies aster (Aster oblongifolius) gets its name. These plants are absolutely covered with sky-blue flowers in September and October. And the flowers are visited by clouds of little bees and wasps. It's a delightful plant that has been trouble-free so far for me this year. 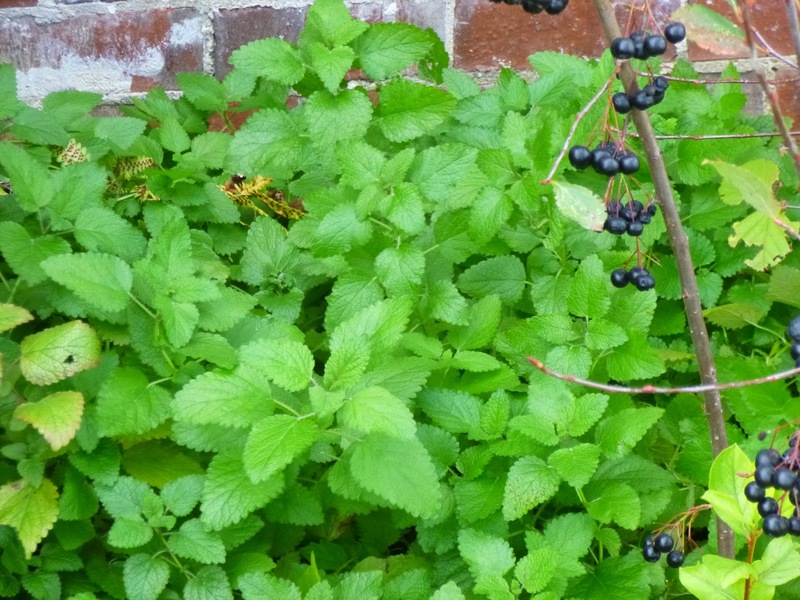 The dense foliage also does a great job of suppressing weeds. This was my first year growing asters, so I'm excited to see how they perform next year (presuming of course that they survive the winter without any problems). 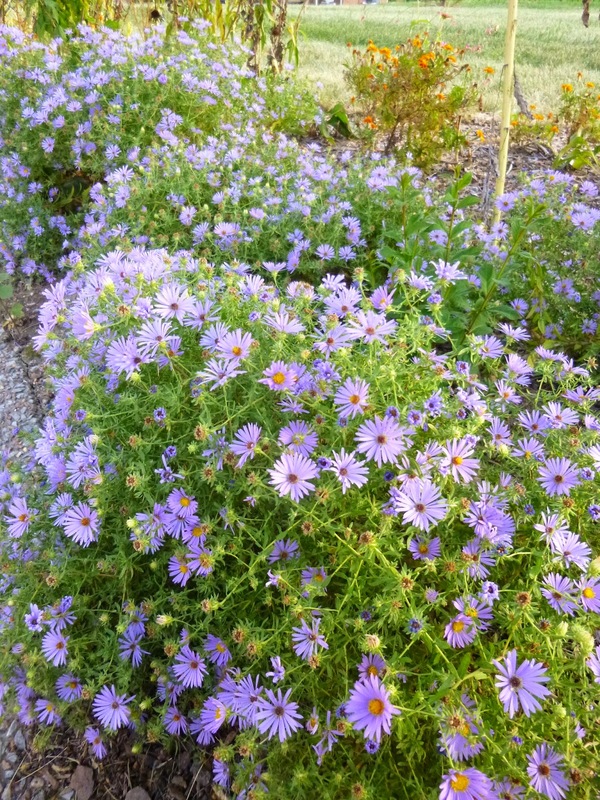 Just another photo to show how floriferous all three October Skies asters have been. Charming, lovely plants. 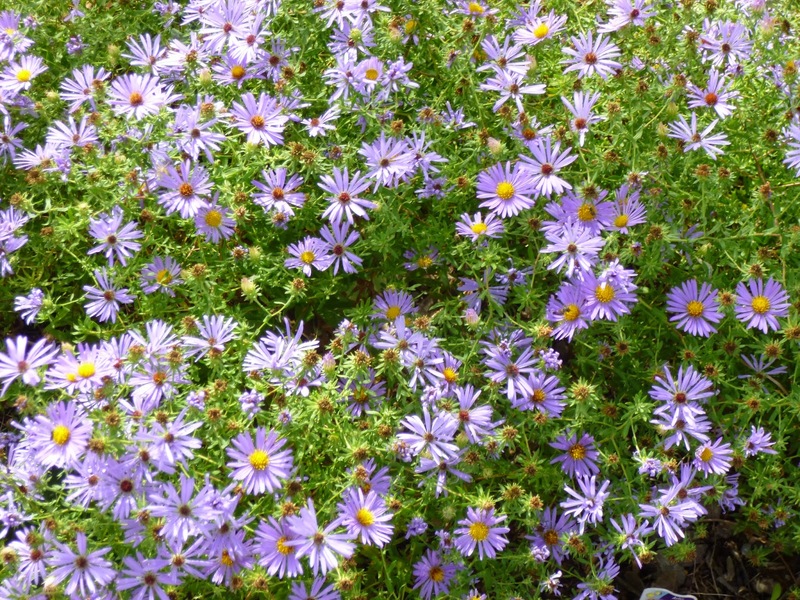 Unlike some other asters (I'm looking at you, New England asters), that can grow tall and gangly with defoliated lower stems, the October Skies aster stays dense and bushy. And at least this year, it probably topped out at about 12 inches high with perhaps a 14-18 inches spread. Definitely a lovely foreground plant. 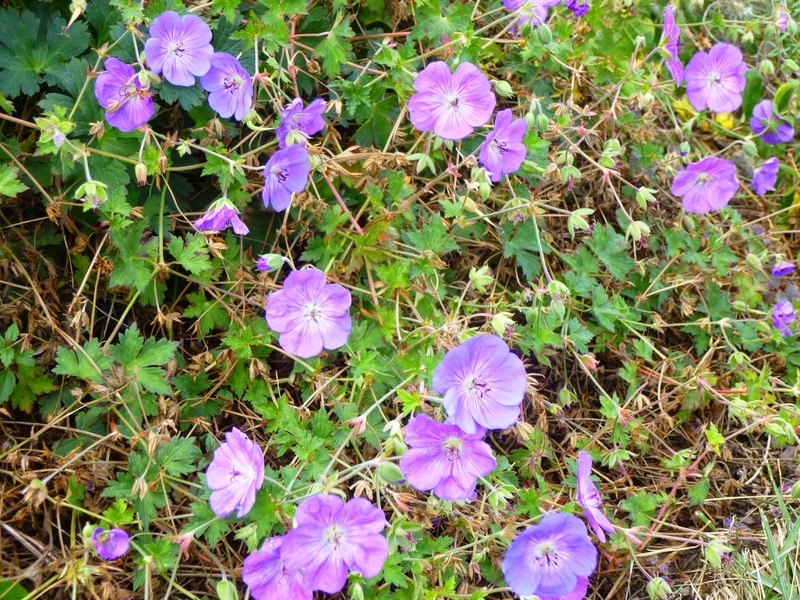 Finally, a definite contender in the Energizer bunny category, this is Rozanne Cranesbill Geranium which has flowered for at least four months (early June through early-to-mid October) and will probably keep going until a hard frost with no deadheading or pruning required. (It accepts pruning if it rambles out of bounds, but no pruning is necessary to stimulate flowering.) What's more, I think the foliage quality actually improved on Rozanne throughout the summer and into autumn. One of the first plants I added to my garden, Rozanne has survived a couple of transplants and given me so much joy over the years. I think anyone who can grow Rozanne (hardy to zone 5), should give her a try.